How to shop BLACK FRIDAY with ezbuy! Have you marked down the date 25th November for the biggest Christmas SALES yet?! If you haven't, thank yourself to land onto this page because it's still not too late, you still have time to get prepared for the BLACK FRIDAY sales. Black Friday is known to be the biggest, craziest Christmas shopping season with lots of sales and deals from most U.S brands. But with that, how can we Singaporeans benefit from this great Black Friday Sales? The answer is easy - use Ezbuy (yep again!). The following brands are just one of the many brands that will go on sales and great deals during Black Friday Sales. We have Amazon, Nike, GAP, SEPHORA, Bath&Body Works and even Colorpop! There are many reasons why people go insane during the Black Friday sales, and we are not excluded. Though you're not physically in the US, you too can enjoy great shopping deals. - They do not always bring in all the variety, colours and types of the item we see in Singapore. US have all the kinds because duh, they came from the US. - It's much cheaper buying straight from the US! How do I shop on Black Friday Sales? Which forwarder/agent should I use to help ship my items from US directly to Singapore? You might have heard of Ezbuy from Taobao 11.11 shopping day. Little do you know, Ezbuy does ship your items from the US from you too! In fact, Ezbuy offer one of the best shipping deals with low shipping cost and free repacking options (to save on volumetric shipping). PS: Sign up here and get $10 ezbuy vouchers for free. No minimum purchase required. The best thing is, I read that Ezbuy will gather and source for all the best deals on US sites so that you can one shot browse them all. They will also be conducting 24 rounds of Flash Deals with all the hot & popular U.S product and giving away FREE cash off shopping vouchers to everyone! (omgawd). Starting from 23rd to 29th Nov, ezbuy is offering one of the lowest shipping fee of $1.50/500gram for Buy-for-me service and $3.99/500gram for Ship-for-me Forwarding service. 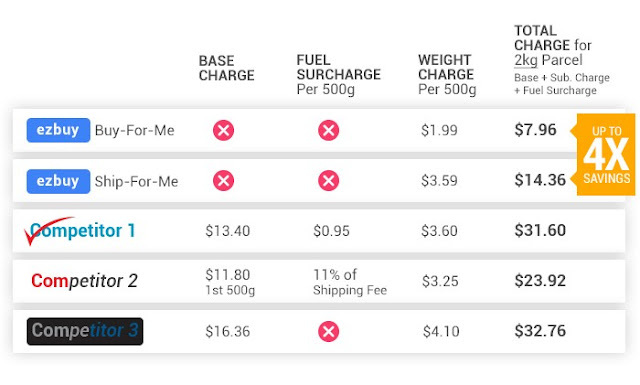 No base charges, no fuel surcharge! What happens if the site only does "Ship within US only"? Ezbuy’s Buy-For-Me service helps to make all your purchases, inspect your goods, monitor your shipments and handle any after-sales issues. All these for a handling fee as low as 5%. For more, visit ezbuy site on the Buy-For-Me service. Say you're interested in this sneaker from Azel Arigato. You just have to paste the link from the site onto ezbuy search bar. After which, select that the item is from the US. If ezbuy does not recognise the item, simply fill up the details such as the price (in US dollar) and it'll automatically convert the price for you. Also fill up other details such as size, color and the link. Do bear in mind that this is NOT the final price you are paying. You will have to top up any difference (resulting from wrong exchange rate) and handling fee as well. Just a quick note: you can download hotspot shield into your chrome browser so that you can browse US sites without being blocked. New to ezbuy service? Click here for more instruction on how to use ezbuy too! Get $10 voucher by simply signing up and get $10 shopping voucher straightaway. No minimum spending, no string attached. That's it for now, enjoy BLACK FRIDAY SALES!! !